Over the academic year our children take part in six league matches, the City Champions in November and a end of season tournament in June. So there are lots of opportunities to represent your school team! PLEASE SEE OUR LATEST NEWS PAGE TO SEE ALL OF OUR MATCHES/COMPETITON RESULTS THROUGHOUT THE YEAR! Just before the holidays, Jimmy "jumpshot" Smith, (basketball coach and former Nottinghamshire Sporting Development Officer) asked me if I would like to put forward one of our pupils for a free place, due to a donation from an unnamed sponsor at his February half term basketball camp. I thought of Ellie White and contacted her parents who quickly replied and excepted the place. Ellie White, a four foot something Year 5 at Old Basford School is living proof of the saying, " you don't have to be tall to be good at basketball!" But you do have to be skilled ! Ellie certainly showed everyone at Jimmy Jumpshot's Basketball Camp at Jesse Gray School over February Half-Term that she's got the skills to be successful in this popular team sport. Ellie was named Most Outstanding Female Player resulting from a sparkling all day performance which saw her win the Free Throw Contest scoring 9 out of 10 free throws and dazzling all comers in the Level 2 Pirates Dribbling Contest which she won as well. Ellie then followed this up by carrying the scoring load for her camp team in the league play-offs. Camp Director Jimmy "Jumpshot" Smith said, " Ellie has as much talent as I have ever seen and for her age she can focus on what she has to do as well as anyone in her age group.She is just fun to watch and a joy to coach.When we were selecting the awards my assistant coach put her forward for "Most Outstanding" before I could say anything.Based on her performance she deserved the award.She will be a huge asset for any team she plays for and I wish her every success in the future." Tonight (17.1.18) two of our team had their debut performances for school, both Rowan and Kenzie played brilliantly and scored a basket each! ​The team as a whole were just outstanding, their collective passing and superb defence allowed them to really shine! PROUD! Congratulations to the Old Basford Basketball team who tonight (20.04) took on West Bridgford Junior School and Claremont Primary School. The team played just brilliant, worked so hard and chased down every ball! Their defence was excellent! Special praise to Alisha for a strong game! Two amazing shots from distance where taken by Tae Jhaun and Ethan. Finally a very big well done to both Taylor and Abdel for their debut performances for school tonight! You were both excellent! Tonight (23.03.17) we had a league match against both Burford Primary and Woods Foundation! 5 of our team made their debut for the school basketball team and they all stepped up to the challenge. The whole team played with energy, team spirit and passion! We won our first match against Wood Foundation 8-4, and were so close against Burford but let in a last minute basket so the match finished 6-7. FANTASTIC EFFORT FROM ALL THE TEAM! 'PROUD' OF YOU ALL! 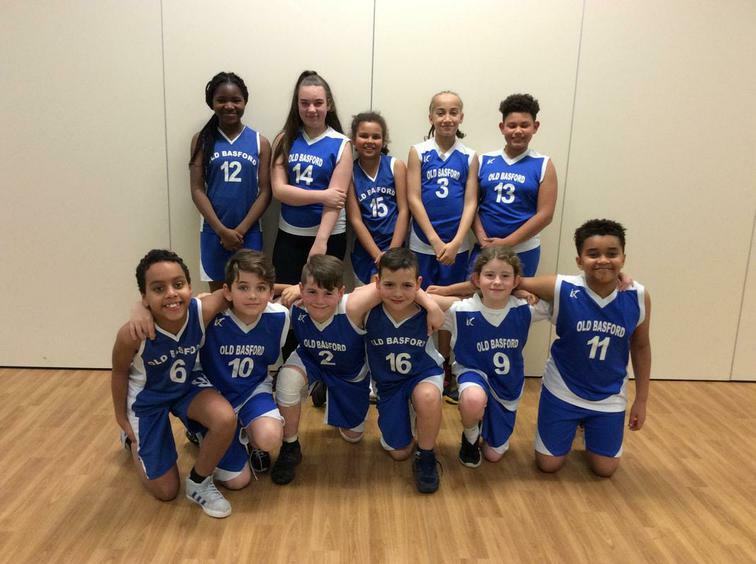 The last two Thursday evenings Old Basford School's Basketball team have competed in two mini tournaments at St Edmund Campion School in West Bridgford. We have seen 7 children make their debuts for the school team, all have played with real character and excellent team spirit. I am tremendously PROUD of the entire team!